Upon review of the obtained data, the team determined that children in the autistic group generally had a lower diversity of gut microbiomes compared to healthy children in the control group. The autistic children were also lacking in three specific types of gut bacteria responsible for breaking down carbohydrates and fermenting foods to make them digestible and their nutrients assimilable. These two variances in microbial composition shed new light on the physiological nature of what is otherwise a poorly understood condition. "[We] demonstrated that autism is closely associated with a distinct gut microflora that can be characterized by reduced richness and diversity as well as by altered composition and structure of microbial community," wrote the study team, led by Dr. Rosa Krajmalnik-Brown, Ph.D. "Most notably, we also discovered that the genera Prevotella, Coprococcus, and unclassified Veillonellaceae were significantly reduced in autistic children." These findings speak volumes, particularly with regards to observations made by premier gastroenterologist Dr. Andrew Wakefield more than 15 years ago. Though it ultimately cost him his career and reputation at the hands of Big Pharma-controlled governments and media outlets, Dr. Wakefield was one of the first medical professionals to identify a solid link between childhood vaccines and gastrointestinal damage. Why is this significant? Because vaccine-induced gastrointestinal damage is a primary cause of many of the symptoms associated with ASD. As it turns out, a damaged gut, particularly during a child's developmental years, prevents the proper absorption of nutrients required for healthy neurological development. 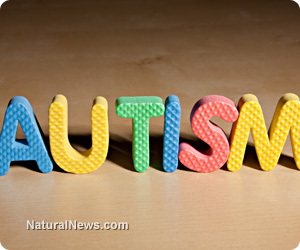 Forward-thinking scientists and medical professionals are finally connecting the dots and discovering that, in many cases, childhood vaccines are directly responsible for causing the systemic gastrointestinal damage that produces the body of symptoms we now know as autism. "Vaccines cause the underlying physical conditions that result in the pain, neurological damage, immune system disorders, gastrointestinal damage, and yeast overgrowth -- all of which combine to produce the behavioral symptoms that result in the 'autism' diagnosis," says Marcella Piper-Terry, M.S., Founder of VaxTruth.org. "Vaccines cause gastrointestinal damage ... (which) causes malabsorption of nutrients necessary for proper brain function." "Malabsorption of essential nutrients causes immune system disorders, seizures, encephalopathy, etc. ... and that's what leads to the ultimate diagnosis of 'autism.'" In other words, vaccines do not "cause autism." But they sure can cause an array of physiological problems inside the body that eventually lead to an autism diagnosis. Because it can take months or even years for these problems to fully develop in autism, however, vaccines are simply assumed by mainstream medicine to be unrelated to its development, even though all the indicators point to vaccines as the true instigators.